We are your reliable partner for used buses since many years, located in Herxheim ca. 20 min from Karlsruhe by car. With our wide range of used buses and our customer-oriented team, we are going to support you whether you want sell your used bus or you are interested in buying a reliable bus to expand your vehicle fleet. We will arrange the licence plates, shipping to your location or customs documents for you if it is requested. Please contact one of our employees to get specified information of our current stock or have a look at our stock list to get a general survey. - We buy your used bus! We are consistently looking for used buses of all kind of categories. Please offer your coach, intercity-, city- or midi-bus. We will respond immediately with a purchase offer. We are offering consistently a wide range of used, well maintained buses. Hereby our goal is to provide used buses in a good quality to satisfy the needs of our customers. 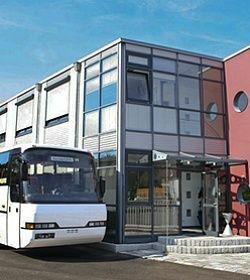 In cooperation with our company ProBus GmbH we are pleased to present a range of new midi buses. Our portfolio is covering all kind of midi buses e.g. a Mercedes Sprinter with 20 seats, a city bus with low entry in the back or the fully equipped coach with 30 comfortable seats. - get our latest offers! Unsere aktuellen Angebote regelmäßig per Newsletter erhalten.